ZiBo Hongye Shangqin Plastic and Rubber, a Chinese company, has donated 50,000 pairs of disposable medical protection gloves to aid in the fight against Ebola virus. 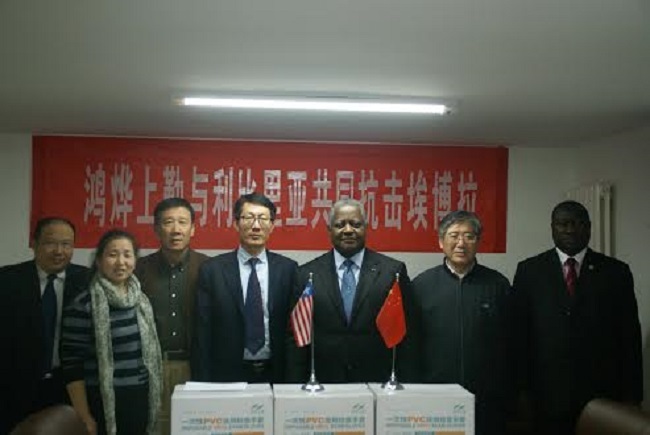 Also known as Hong Chin Plastic and Rubber Co. and based in Shandong Province, the company made the donation, valued at about 230,000 RMB (approximate 38,000 United Stated Dollars), on Thursday, December 04 at the Liberian Embassy in Beijing, the Chinese capital. 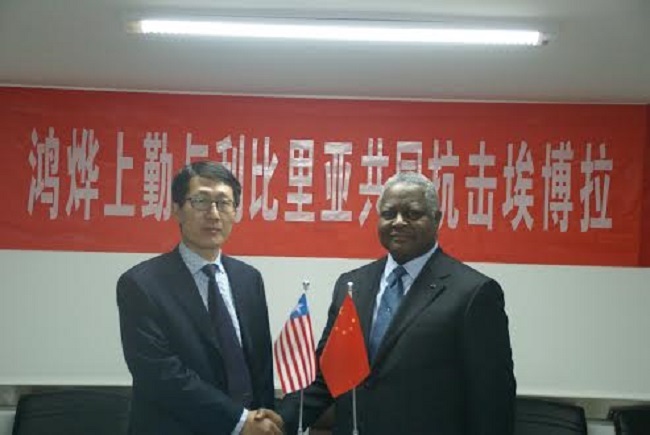 General Manager James Ren, in his presentation thanked Liberian Ambassador D. Mckinley Thomas for his recent visit to the company’s headquarters in Shandong Province and stated that the decision by the company to make the donation was in response to the Letter addressed to the World by Liberian President Ellen Johnson Sirleaf, which was shared with them by the Ambassador during his visit. Ambassador Thomas, receiving the donation, expressed appreciation to the representatives of the company, general manager James Ren, and Ms. Yanling Jia, deputy general manager, for the kind gesture. He noted that the company’s generosity and empathy with the Liberian people during this difficult period would long be remembered and appreciated by the president, the government and all of the people of Liberia. The Ambassador further noted that the timely support being received from the Chinese Government and Chinese companies was indeed making a significant difference in helping to win the fight to eradicate the disease in Liberia and the other affected countries. The HongChin Plastic Rubber Company is a Chinese foreign joint venture company established in 2003, with 16 production lines and an annual production capacity of about 2 billion pieces of medical and protective PVC gloves, which are exported to many countries, including England, Germany and the United States of America.